Cuishan Mei (left) and Sayed Shah, both recent immigrants, say their experiences has led them to want to help people through science. Sayed Shah grew up in Pakistan in a home without electricity — until his science and math classes taught him how to create a water-powered electric motor that could illuminate his family’s dinner table at night. The experience taught him that he wanted to help people through science. “It helped me bring some light to my family,” he said. Cuishan Mei, who grew up in China, lost her grandfather to cancer, an experience that underscored her determination to study science and perhaps create lifesaving medications. “I want to help people like him, if they don’t have any hope,” she said. 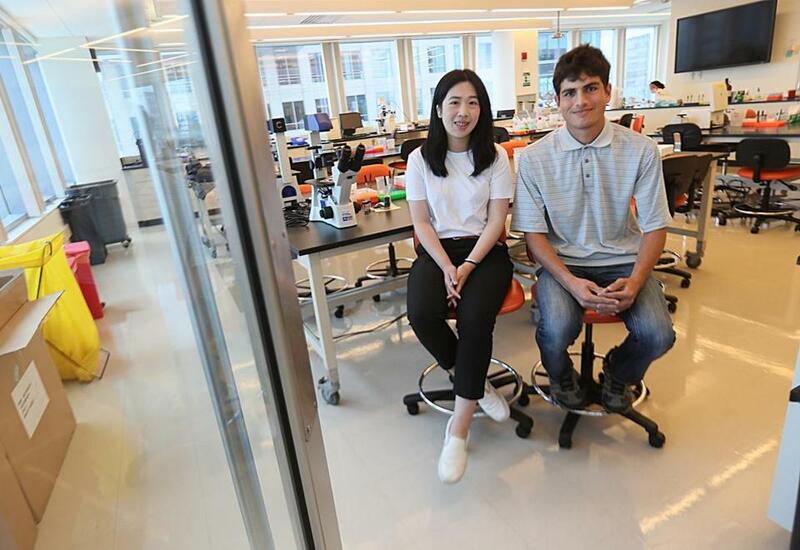 Shah, now 20, and Mei, 18, both immigrated to Boston as teenagers. He graduated from the Boston International Newcomers Academy, she from the John D. O’Bryant School of Mathematics and Science. Both have summer internships at Vertex Pharmaceuticals. And this fall, both will study at the University of Massachusetts Amherst, recipients of four-year, full-ride scholarships. The Vertex Science Leaders Scholarship has been around since 2014, allowing recipients to study science, technology, engineering, or math at a University of Massachusetts campus. “I felt surprised at first,” said Mei, who plans to study biochemistry. Finally, she said, she won’t have to put pressure on herself or her parents to come up with the money for college. Mei, who lives in the South End, said her experience in the United States was difficult at first. “It was hard, pretty hard, and uncomfortable because I don’t have any friends here and I didn’t speak English that well,” Mei said. She’s hoping to take advantage of attending a big university. “I want to participate in a lot of clubs because I know there’s a lot more opportunities in college than in high school,” she said. Shah, who plans to study computer engineering in college, said he now has a sense of security — and the knowledge that his education can’t be taken away from him. His goals for college go beyond the courses he’ll attend. “I want to graduate from UMass Amherst . . . meet new people from different countries, and create a cricket club which I love,” he said. Allana J. Barefield can be reached at allana.barefield@globe.com. Follow her on Twitter at Allana_B18.